The below questions are those we're most often asked. Click on the area and question and the answer will display underneath it. If you'd like to know the answer to something that's not included here, please email us, call us on (720) 515-3567. Thank you! We are an all-inclusive dog care services business providing: private on-leash walks, group (Run with the Pack Walks) walks, in-home pet visits, in-home overnight and extended sitting, in-home private boarding, day care, evening care and pet taxi.. Special requests? Please let us know. For services details, please visit Dog Walking Pet Sitting Services page. Bergen & Hudson County's, New Jersey; Westchester County, NY and Dallas (and surrounding areas), Texas (soon to be in Boston, MA and Hartford, CT). Please complete the Dog Walking Pet Sitting Client Booking Form, or call on (720) 515-3567. We will be happy to discuss your dog care needs. You will be invited to a complimentary welcome consultation, and this first meeting will help familiarize us with you and your dog or other pet, and give you an opportunity to go over their routine and any special dietary and exercise needs. At Wag-A-Little, we like to understand your needs before assigning a rate for your care. We have a basic guideline we observe, but have some flexibility in pricing for different levels and packages of services. We base our pricing on many factors, including the type of pets you have, driving distance, and type and frequency of service you require. Please feel free to email us or call us on (720) 515-3567 and we’ll work up a plan for service designed to meet your specific needs and budget. For rate details, please visit Our Dog Walking Pet Sitting Rates page. Once you book service with us, we will email you a confirmation which will also serve as your statement for your records. Once confirmation email is received payment is due. We accept cash, check or credit card. For payment details please visit our Dog Walking Pet Sitting How It Works page. Am I allowed to give my Wag-A-Little Dog care giver a gratuity for great service? Certainly! You can give gratuities directly to your Wag-A-Little care giver, or you can mail them to us to pass on. 100% of gratuities received go directly to your Wag-A-Little care giver. For Dog Walking, 24 hours cancellation notice is required. Cancellations received less than 24 hours before any arranged reservation are subject to a 100% cancellation fee. For pet sitting, 48 hours cancellation notice is required. Cancellations received less than 48 hours before any arranged reservation begins are subject to a 100% cancellation fee. For cancellation details, please visit our Terms page. Yes, we do charge a small additional fee over the major national holidays. We will let you know this at the time you book our service. This is a way for us to reward our team who are giving up their holiday time to take care of your dog. You can see full details of our Dog Walking Pet Sitting Holiday Schedule here. We provide a free in-home consultation so we have the opportunity to meet with you and your pet. This ensures that we get all of the information necessary to provide the best care for your dog. To schedule an appointment, please complete the Dog Walking Pet Sitting Client Booking Form, or give us a call on (720) 515-3567. Should I call or email you when I need to get in touch? Phoning, emailing are both good ways of contacting us, as we check our mailbox and voicemail very often. If you need to speak to us immediately, please call us on (720) 515-3567 and we will be happy to talk to you about how we can help with your dog care needs. If I do call or email you, what sort of information should I leave? We check our messages often so if you get voicemail don’t worry, we will return your call as soon as we can. Although you will be asked to fill in a detailed reservation form, please leave a message with your dates of travel, or let us know which days you need our services. Please also let us know the town you live in and any other important information we might need to better assist you when we call you back. If you have a cell phone or number you can be reached at directly this will help us contact you more quickly. We do return all calls even if we are not able to help you with your specific request. Alternatively you can complete and submit the Dog Walking Pet Sitting Client Booking Form on this site right now to let us know what your needs are. What does ‘The Wag-A-Little Dog Care Guarantee’ mean to me? Wag-A-Little absolutely, positively guarantees your satisfaction with every service we provide. Simply make us aware of any dissatisfaction you may have had, and we will make it right. It’s that simple. Please feel free to email us, call us on (720) 515-3567. Absolutely! Overnight services book up quickly, so please try to allow as much advance notice as possible. If we are unable to provide you with the service you request, we will do our very best to find the next best solution to meet your needs. Most important is that no dog goes uncared for and no plans are canceled! Rick Moffett on (720) 515-3567 or email us. What makes Wag-A-Little different from other pet care companies in the area? 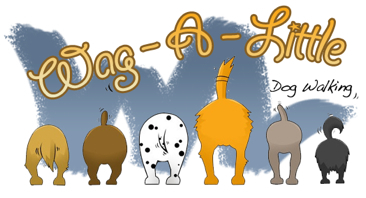 Wag-A-Little is a local, independently run, dog care business. Our goal is to provide you and your dog with the utmost in personalized, valet-like, attention so that you and your dog are both happy and healthy. We utilize an on-line or over the phone reservation system with one goal in mind - to make it easy for you to obtain the right services for your dog. We are easy and flexible to work with. Lastly, we offer a money-back guarantee if you are ever dissatisfied with our service. To schedule an appointment, please complete the Dog Walking Pet Sitting Client Booking Form, or give us a call on (720) 515-3567. How can I get a job working with Wag-A-Little? We are always looking for reliable, committed dog care givers – walkers and pet sitters. If you are interested in working with us as a dog walker or pet sitter, please email us. If you are an existing client of ours and you're considering a job working with dogs, we'd be especially delighted to talk with you. Many of our wonderful team members were initially clients who are now thrilled to have a part-time job working with dogs (and we are thrilled to have them!). We have a top-notch team and delight in working with those who have the same high quality standards. Yes. We provide dog walking services Monday through Friday and on weekends, and we require a minimum of 2 days a week. Some of our clients use our dog walking services on Mondays, Wednesdays and Fridays, others prefer Tuesdays and Thursdays, but most use us every day of the week. All we ask is you arrange set days with us so that your dog and their walker can have a regular weekly schedule. We are not often asked to provide walks for clients who only need a few days here and there, but please do email and ask if we can be of help if this is all you require. What is the ‘Run with the Pack’ walk and why would I do this over a private or one-to-one walk? Our dog walkers take a maximum of six dogs for pack walks at any one time. We try our best to match up dogs that live in the same area, and that have a similar temperament and energy level. Dogs thrive on interaction with other dogs. By having your dog group-walked several times a week you are giving them the gift of a pack brother or sister that they see regularly. We can also arrange solo walks for dogs that are not good around other dogs, for which there is an additional fee. Please call us to discuss your dog’s specific walking needs. Fights will sometimes happen. You can be assured that we are carefully watching your dog’s walk time and are always on the lookout for signs of a fight about to happen. We are constantly observing the dog’s body language and redirecting inappropriate play. We have various methods for breaking up fights that will keep the dogs and our staff safe including spraying water from a spray bottle to distract the dogs. If a dog exhibits unacceptable behavior, the dog is given a time out and the owner will be informed of the concern. We will then work with the owner to resolve the problem or the dog will be allocated to a different group or approach. After we have received your information and requirements, we will match you with the sitter we feel is best for you and your dogs’ needs. If you work full-time, we will provide a pet sitter who will be arriving after work and departing again in the morning for work, just like you would normally. If your dog needs a sitter who will be around a lot, we will set up a meeting during which you will get to know a sitter who has a flexible schedule. Our fees vary upon the amount of dogs or pets involved and the amount of time you would like the sitter to be at your home. All of our dog sitters have gone through extensive reference and history checks and are committed to providing the best care for your pet and home while you are away, as well as leaving your home neat and tidy when you return. Please visit our Pet Sitting page to get a more in-depth look at what our dog sitting service provides. In most cases, you get what you pay for. Isn’t it worth a little more to ensure your pets and home are in safe hands, and that if something goes wrong, we’ll fully cover it? All of our staff are professionally trained, bonded and insured individuals skilled in providing loving care to pets and homes. We make every effort to ensure you get the same sitter on an ongoing basis. At Wag-A-Little, one of our main goals is to create a bond between your sitter and your pets, so they always feel safe and loved, even in your absence. If your previous dog sitter is not available then a substitute sitter will be, and we will set up a meeting so you and your dog get to know the new sitter before you have to leave. Once you have booked service through our client reservation system, you should expect a phone call from your assigned sitter within 24 hours. Please contact us if you do not hear from them during this period. Can I hire my dog sitter directly without going through you? No. Please do not place our sitter in an awkward position by offering them dog sitting or dog walking employment outside of our service. You are sometimes given the private cell phone of our sitters as a means to reach them in an emergency while you are away. We respectfully ask that you do not contact them to set up future jobs when you return. Our care givers are prohibited from soliciting or accepting employment directly from our clients, and have signed a legally binding contract to this effect. Thank you for honoring this policy. Do you board dogs at Wag-A-Little? Just give us a call on (720) 515-3567 or email us and explain your needs to us. If your pup is due for a visit to the groomer or vet, we can pick them up and drop them off so you don't have to rearrange your schedule. If you've ever had trouble meeting a pick up time, we can alleviate the stress and have your dog back home before you are! If you are moving to a new home and/or need your dog transported on a journey we can also help - Please ask about our Dog Taxi Program when you contact. At Wag-A-Little, we like to understand your needs before assigning a rate for this service. Oftentimes, we’ll combine the taxi service with our rates. We have a basic guideline we observe, but have some flexibility in pricing for different levels and packages of services. We base our pricing on many factors, including the type of pets you have, driving distance, and type and frequency of service you require. Please feel free to email us, or call us on (720) 515-3567 and we’ll work up a plan for service designed to meet your specific needs and budget. For rate details, please visit Our Rates page. This is an industry standard program. We keep two sets of your keys. The first key is used to access your home for walking or sitting services. The second key is kept in our office as a back-up in the unlikely event that the first is either misplaced, broken, or fails to work in your lock for any reason. Participating in this program enables us to be fully ready to provide you with immediate services when you need us, without having to plan a meeting to pick up your key. This program also makes it easy for us to provide you with immediate coverage should you ever have an emergency, or for any other short notice situation. Ask about joining our Dog Walking Pet Sitting SafeKey Program at our initial consultation. There is no fee to join the SafeKey Program if you activate it during your initial consultation. For your complete peace of mind, we background check every Wag-A-Little team member. Many casual dog walkers and pet sitters do not or cannot provide you with proof that they have no prior criminal convictions. Casual dog walkers can be cheaper to employ, but what price do you put on the security of your home? Special requests? Please let us know. For services details, please visit Our Services page. If you'd like to know if we can do something that's not included here, please email us, call us on (720) 515-3567. Thank you!